Paper presents a brief review on technical-economic investigations in the field of Reusable Aerospace Systems, carried out by NPO MOLNIYA. Some results of the investigations illustrating the efficiency of the creation and application of such systems are shown. Possible sequence of the Aerospace Systems’ development from the MAKS-D Demonstrator of the space technologies to the fully Reusable Two-Stage Aerospace Launch System on the base of the Carrier-Plane is resulted. minimization of the creation and operation cost. To solve these tasks NPO MOLNIYA created new special departments, including the technical-economic investigation department. This department was responsible for calculation and analysis of technical and economic characteristics (TEC) for whole system life cycle: development work, production and operation of flying vehicles. The authors of present article and other staff, among them – leading designers Mrs. Novikova L.L., Mr. Yuryev G.P., have been working in this department since 1976. Tens technique for TEC calculation for different phases of life cycle of flying vehicles (FV) on the basis of existing technique, for example see , , were developed by this department’s work-force [3,4]. Due to high costs of the expandable launch aerospace systems a creation of the reusable aerospace systems has become the most important one since 1970s. The deep economic analysis on the stage of system development and operation, cost components of aerospace system elements designing, production and operation, as well as determination of analysis criteria were considered one of the most important trend of production activity of scientific and engineer brainpower of the NPO MOLNIYA. specific cost of injection and several others technical and economic characteristics depending on performance specification of analyzed projects. At leading participation of technical-economic investigation department of the NPO MOLNIYA in co-operations with research institutes of aircraft industry, such as NIAT, NII of economics, NTTs KOMPAS, GosNIIAS, developed technique and fulfilled calculation of technical and economic characteristics for each phase of life cycle of aerospace system. These institutes have developed and approved tens methods, fulfilled tens research works for optimization of reusable and multipurpose aerospace systems. Mr. Demukh Z.A., Demchenko V.P,. Archakov V.I.. headed the labor collectives of departments of these institutes. There are own techniques with various degree of analysis, degree of detail and as a result a calculation accuracy for different phases of aerospace system development. On first phases more simplified techniques are used as only minimal part of initial data is known. On following phases when range of considered technical characteristics increases more precise theoretical-calculated techniques are used. At the stage of technical designing the techniques providing more actual values of technical and economical characteristics are used. At this stage the cooperation of all components works completely, system outlook and its technical and technological characteristics are determined largely and it is possible to estimate labor-input of works and standards for every components of development works: designing, production, experiments, flight tests, operation and other. Analysis of payload quantum and freight flow dynamics in Russia and abroad as well as prognosis of space flying intensity of launcher facilities flight activity resulted in that the MAKS system can fulfil up to 75…85% of forecasted launching into near-earth orbit. Considering sufficiently high level of completion of MAKS project (~20%), availability of experimentally-stand base and production capacity, MAKS project could be completed for 5…6 years (i.e. by the beginning of 2000). Forecasted space flight programs by that period as well as space service market, including commercial projects in Russia, CIS and abroad are so considerable that MAKS-type system would yield large economical effect. It is saving of budget on creation and flight programs – up to 25…30% from total financing in comparison with launchers. The MAKS system also would allow Russia to get considerable profit from commercial launches which, if relying on prognosis still would be on great demand in America and Europe by the beginning of next century. Using of the MAKS system into commercial space service market for injecting and recovering of payloads, maintenance service of the ALPHA space station and other similar services, even 15…20% of market (5…6 launches per year), would allow Russia to realize annual net profit not less than $400,000,000…500,000,000 per year (if world price of injection stayed the same). Even such small introduction into commercial space service market would allow, only by commercial operations, completely recover for 5 years all expenditures spent on the MAKS development. It is necessary to indicate that MAKS introduction into commercial space service market is not the only and major way for recovering all expenditures spent on the MAKS development. The major way is a considerable reduction of expenditures on annual flight program by reduction of launch cost. Increasing of the MAKS’s flight intensity within programs of Russian space agency (for example, 5 launches during first year, 15 launches during second year, 20…25 launches beginning from third year) will allow to recover completely all financing spent on the MAKS development during three first years. This is due to reduction of 2…3 times of launch costs in comparison with launch costs of expandable launchers. The technical and economic researches and their results were thoroughly analyzed by NPO MOLNIYA in co-operation with NII of economics, GosNIISTAT and NTTs KOMPAS. The operation of the MAKS system would not only lead to reduction of annual budget expenditures but also allow eliminating pollution of near-earth space by expandable elements. NPO MOLNIYA with designed project of the MAKS system occupies leading position in development of the reusable aerospace systems which provide wide range of advantages in comparison with existing expandable injection systems and, thanks to this, allow increasing the space flight activity in the nearest future. operation of the MAKS system doesn’t require large additional equipping of ground-based technical and landing, control complexes and other ground-based maintenance systems thanks to using, in general, of the existing ground-based support and control systems. Thus, the MAKS project is still on the stage of development work has low technical and economic risks, guarantees providing of required technical characteristics in short time period. The long-term and deep R&D on development of the MAKS system and manufacturing of full-scale mock-up of external fuel tank and orbital plane provide high-level of readiness and project realization. In 1988 NPO MOLNIYA created full-scale preliminary design (approximately 2000 books) and several appendixes. Besides, engineering notes on analysis of possibility for injection of the existing and developed payloads by means of the MAKS-OS and MAKS-T systems as well as number of technical suggestions on missions of injection and transport maintenance service were produced. In 1993 the NPO MOLNIYA in co-operation with head enterprise developed State Program project of creation and and application of the MAKS system. The comparison with other launch facilities, both expandable ones and reusable, shows high efficiency of the MAKS system for solution of different tasks. 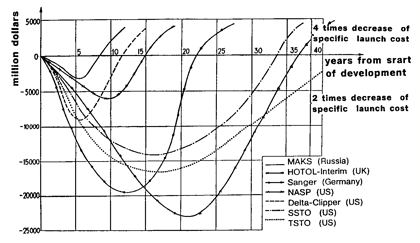 Figure 1 shows dynamics of cost for MAKS development and operation in time. It is well seen that profits appear on 5…6th year of system life cycle from execution of first launches, transportation operations of carrier-planes, realization of scientific and technical achievements introduced in the MAKS, lease of ground-based facilities of systems and other conversion actions. The expenditures on system development are completely recovered on 8…9th year of life cycle and from 9…10th year net profit could appear. 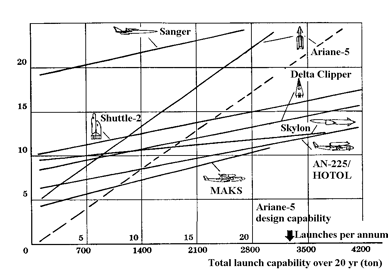 Its margin, generally, depends on intensity of commercial launches. All space countries thoroughly analyze projects of reusable aerospace systems. The degree of their readiness is quite different. That’s why duration and cost of development and exploitation programs considerably differs. 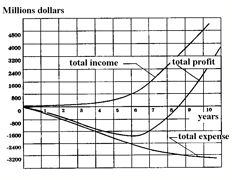 Figure 2 depicts comparative dynamics of life cycle costs for different projects. Their integrated components are determined in accordance with same methodology through “dry” stage masses of stages, statistical values of production and development specific costs at the same flight program and equal freight flows. As figure shows, development costs and periods of these systems considerably differ: from 6 years for the MAKS system to 20 years for the NASP system and accordingly up to $3 billions for the MAKS system and up to $22 billions for the NASP system. Depending on that payback periods differ as well: from 3 years beginning from operation for the MAKS system to 15 years for the NAPS system. The major problem of rapid realization of MAKS system is financing problems. Possible financing schemes of MAKS development were shown in above-mentioned State Program. The authors of State Program showed that MAKS project could be realized not only at the expense of budget financing (through Russian Committee of the Defense Industry, Russian Space Agency and other consumers) but also at the expense of international investments and credits issued by Russian commercial structures. A finance-commercial group consisted of participated organizations and banking groups can be organized in Russia. To promote development of the MAKS system it is expediently to organize international consortium which would provide concentration of technical and finance efforts, all types of ground and flight tests and operational introduction of system into operation. At that it is necessary to carry out marketing research and organize the launches program profitable for potential consumers and MAKS’s designers. This program must to take into consideration the standards of actual pricing, recoupment of project, profitability and insurance costs not only for launch consumers but for MAKS’s designers as well. NPO MOLNIYA also fulfilled different technical and economic investigations of dependence between flight costs and payload capacity and predictable freight flow for different schemes of reusable aerospace systems. Such dependences for several systems at injection of 7-tons payload are shown on figure 3. As illustration approved by the British Aerospace company shows, flight costs of aerospace systems with reusable orbital plane and the MRIYA carrier-plane is considerably lower in comparison with other considered prospect projects. Such calculations fulfilled in accordance with the same methodology, with identical initial data and equal restrictions give fully depiction of operation effectiveness of the MAKS system as a profitable launch facility. The financial situation of MAKS designer’s cooperation owing to “perestroyka” and industry conversion in Russia doesn’t allow operational developing of system components. That’s why just as in European for the ARIAN-5/GERMES project, in Britain for the HOTOL project, in Germany for the ZINGER project in so in Russia a trends appeared leading to co-operative development of demonstrator of space technologies with European Space Agency. In this connection Russia, NPO MOLNIYA in particular, is working out possibility and advisability of realization of relatively cheap demonstrator project based on the carrier-plane and the MAKS orbital plane. In 1995 NPO MOLNIYA performed such project in the network of technical suggestions for Russian Committee of the Defense Industry. This project showed that it was possible to create the MAKS-D demonstrator approximately for 4 years and that its cost would be approximately 20% of cost of R&D works of the MAKS system. On the basis of MAKS-D flight experiments, the MAKS system can be developed later on and then the MAKS-M completely reusable aerospace system. Such sequence of the reusable aerospace system development allows considerably reducing annual expenditures on R&D works and technical risk of development, gradually increasing freight flow served by MAKS. The domestic and foreign consumers would be attracted by experimental adjustment of MAKS, safety and reliability if saying in particular. At that, thanks to flight immediacy and cost reduction a queue on injection would be decreased, intensity of flight would be increased and freight flow would be enlarged gradually. The commercial launch profit can be directed, at great extent, into improvements of elements of the aerospace systems, for example, into improvements of elements of reusable launch units. Described development process of the MAKS system is shown on figure 4 presenting sequence of the development and operation . The researches fulfilled in NPO MOLNIYA resulted in one more important conclusion: efficiency of the reusable launch system is increased at using a small portion of expandable elements. The first example – comparison of the MAKS-OS unmanned version and the MAKS-M completely reusable version. Expandable external fuel tank increases payload mass at low-earth orbit almost in two times and as a result reduces injection cost per 1 kg. If orbit altitude increases MAKS-OS advantages strengthens. The second example – the MAKS-D demonstrator transport version, including expandable space tow, provides injection prime cost not more than $1,500 per kg. The results of technical and economic analysis show that horizontal-launched two-stage aerospace systems with subsonic carrier-plane have several advantages in comparison with single-stage vertical-started launcher: development cost, operating orbit range and injection prime cost. The MAKS system can be created within short period on the basis of existing technologies. 1. N.M. Tchumakov, E.I. Srebryaniy. Efficiency estimation for complicated technical devices. − Moscow: Sov. Radio, 1980 . 2. V.D. Ilichev, V.D. Volkov, V.A. Grushansky. The efficiency of developed elements for complicated systems. − Moscow: Vyshaya shkola, 1982. 3. L,V. Novikova. Methodical principles of estimation of launch aerospace system injection // The work collections of the 1st International Aerospace Conference. − Moscow: RIA, 1994. 4. V.I. Fishelovich, A.V. Alinicheva. The methodic of preliminary estimation of creation cost and maintenance charges for prospect aerospace transport commercial systems // The work collections of the 1st International Aerospace Conference. − Moscow: RIA, 1994. 5. G.P. Yuryev, A.G. Podoroshy. The determination of probability of MKTS element losses during application and exploiting // The work collections of the 1st International Aerospace Conference. − Moscow: RIA, 1994. 6. Yu.M.Kosinsky. About general problems of MAKS creation in the nearest future // The work collections of the 1st International Aerospace Conference. − Moscow: RIA, 1994.